Turkmenistan’s economic perils could drive a person to drink, but that’s more difficult with a new law restricting alcohol sales. Turkmenistan’s government expects less state revenue in 2019 than in 2018. Accordingly the government budget has shrunk from the 95.5 billion manats ($27.3 billion) planned for 2018 to 83.8 billion manats ($23.8 billion). 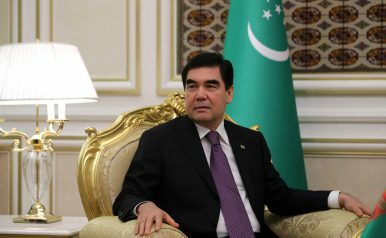 Despite the government declaring 2019 the year of “Turkmenistan – the Home of Prosperity” one could be forgiven for feeling a certain unease when it comes to the prospects for prosperity in Turkmenistan. As Bruce Pannier at RFE/RL pointed out, as of January 1 Turkmen citizens are responsible for paying for their water, gas, electricity, and salt. In September 2018, the government announced the rollback of subsidies for basic goods, which the state had provided for free to citizens since independence. And if you wanted to drink your concerns away in Turkmenistan over your impending electricity bill, even that has become more difficult. As of January 1, 2019 a law sharply limiting the sale of alcohol has gone into effect. The law forbids the sale of alcoholic drinks including beer on trains, airplanes, and ferries and at sports facilities. It also bans the sale of alcohol on holidays when workers get the day off. In 2017, when Ashgabat hosted the Asian Indoor and Martial Arts Games, alcohol sales were temporarily banned in the capital. Although the government did not issue a public order to that effect, merchants at a handful of liquor stores told AP that the authorities had ordered sales halted until after the games were finished. The new law also calls for alcohol sales to be banned on Saturdays and Sundays beginning in 2021, except at bars and restaurants. President Gurbanguly Berdymukhamedov, who has ruled the nation since late 2006 in an all-encompassing cult of personality — replacing that of his predecessor, Saparmurat Niyazov — is frequently shown on state TV engaging in sports, including horse riding and weightlifting. In November, Berdymukhamedov was seen on state television lifting a gold barbell before his applauding cabinet. The stunt, ostensibly to mark the country’s hosting of the 2018 World Weightlifting Championship, earned Turkmenistan a flash in the international media, focused squarely on the absurdity of the regime. Meanwhile, RFE/RL and exile Turkmen media continue to report shortages from across the country. In December alone there were reports of shortages of gasoline in Lebap, cash in Balkanabat, and eggs in Ashgabat. It’s difficult to not come away from these disparate points with the sense that all is not well in Turkmenistan. The regime appears content to press ahead with the facade of prosperity, but one cannot photoshop money into the bank as easily as photoshopping a Turkmen flag into space. In a vacuum, the restriction of alcohol sales, like the government’s pledge to become tobacco-free by 2025, could be seen as positive measures, part of a broader public health initiative. But like the gold barbell, they seem like vanity efforts by an autocrat desperate for praise.